ROBINS AIR FORCE BASE, Ga. -- 1st Lt. Andrea Lewis' mom recently visited her at work, and had good reasons to be proud. 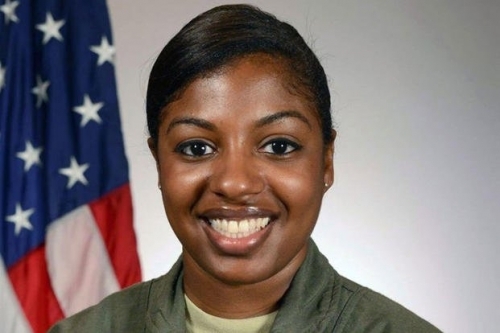 Lewis started her aviation career as a flight attendant for Delta Airlines and now she is a co-pilot for the Joint Surveillance Target Attack Radar System at Robins Air Force Base. Lewis, who lives in Atlanta, is the first black female pilot in the history of the Georgia Air National Guard and is about to make her first deployment. "He always said being a pilot is the greatest job he ever had," she said as she sat in the cockpit of a J-STARS jet. "It was something I wanted to do because he had such a big passion for it, and once he passed, I wanted to be just as passionate about what I'm doing." "It's amazing," she said. "I feel like it's what I was meant to do." Lewis' mom climbed on board a J-STARS jet with her and talked about her daughter's career path. "She has done it on her own, and I have the ultimate admiration for her," Scott said. "As a mother I've got that feeling in my heart that most mothers will have, but I know that she's well trained and she's well qualified," Scott said. "Going over for this deployment I think is going to enhance my abilities that much more," she said. "She's young but she's got a lot of drive," he said. "She's got the potential to be a great leader in the Air Force." "It allows me to be able to encourage other people to do what they really want to do and overcome their fears," she said. � Copyright 2019 The Macon Telegraph.